The Lemp Mansion (www.lempmansion.com) in St. Louis is claimed to be ‘Missouri’s Most Haunted House’, claiming the further title of ‘one of the 10 Most Haunted Houses in America’. Haunted or ‘unhaunted’, this house has been the scene of triumph through to tragedy, with a background of intrigue, scandal and suicide. With the Mississippi River and the Gateway Arch in the backdrop, the Lemp Mansion is a magnificent Victorian relic beside the bustling modern city. What are some of the stories that form the rich history and folklore of the Lemp Mansion? Once the home of the Beer Baron Lemp family, nothing but a storm was brewing the night I visited the Mansion. Originally from Germany, the Lemps made their fortune as America’s first brewers of lager beer. From poverty to prosperity to Prohibition, the family was beset by misfortune, including five deaths by suicide. Three of these occurred at the Mansion, seeming to ignite a range of paranormal phenomena. The Mansion is no longer owned by the Lemps…the last family member died in 1970…but are they still there? Built in the 1860s as a residence and office, the Mansion now serves as a Restaurant and Inn. The distillery, once covering ten city blocks, now stands derelict in the background. ‘Haunted Tours’ of the Mansion are operated every Monday (www.stlspiritsearch.com) but daring diners are invited to inspect the premises at any time. The Mansion thrives off its haunted reputation that is carefully cultivated by the owners (and clearly, by reports such as this!). I engaged in a lively discussion with other guests, as we swapped ghost stories with each other, and the staff. These anecdotes include the phantom sounds of a piano playing and ragtime music; disappearing objects; doors inexplicably locking and unlocking; lights inexplicably switching on and off, and poltergeist-like activity in the bar such as drinks ‘stirring themselves’, glasses lifting off the bar then flying through the air, smashing as they hit the ground. It is said that the Mansion is a hotbed of paranormal activity. I found it to be a hotbed of paranormal investigators. 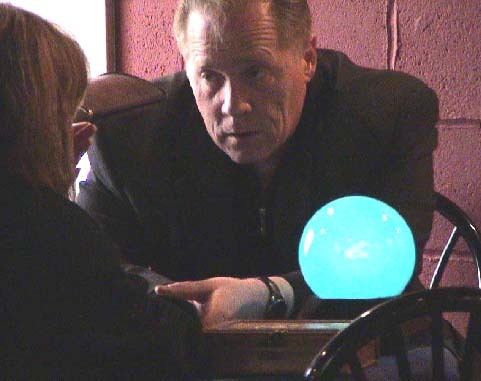 My visit coincided with an investigation by the Iowa Paranormal Advanced Research Team (www.diepart.com). I chatted with a few members of this team, and found them to be friendly and knowledgeable about the reputed phenomena in the Mansion (if not as scathingly skeptical as I!). Still in preparation for their all-night vigil, by this time they had already experienced some odd events: inexplicable feelings of panic, nausea, depression and dread; the sounds of voices and whispers coming from the bedrooms; a sense of being watched; and a sense of being touched. It isn’t hard to list some possible natural causes here (e.g., an overactive imagination fuelled by excitement and knowledge of the stories? Simple background noise?). The full report of their eventful investigation can be found here: (www.diepart.com/379976.html). Many similar organizations have trundled their way through this infamous house, ghost hunting equipment in tow. Following the death of Edwin Lemp in 1970 at age 90, the last member of the Lemp dynasty, the building became a boarding house, and rumors of the ‘Haunted Lemp Mansion’ began to circulate. These intensified when the current owners, the Pointers, purchased the property in 1975. A team of tradespeople who restored the building were reputedly subjected to a range of phenomena, including the inexplicable sounds of screams, gun shots, laughs, cries, and voices calling out their names. Apparently, these were harrowing enough to lead a few workers to quit. In another story, a psychic visited the house and ‘heard horses neighing’. This was evidently ‘proved’ by the later discovery of a ‘horse tethering lot’. The second floor and third floor rooms (the latter were once the servant’s quarters) have been converted into guest suites. It is here that the ‘Lavender Lady’ has been witnessed gliding through the rooms and halls. This apparition, of a woman in a Victorian-style lavender-colored dress, is the reputed ghost of Lillian Lemp. Lillian was once the unfortunate wife of William Lemp, one time family patriarch. She was an eccentric figure who exclusively wore lavender-colored clothing, and adored lavender as a color and a fragrance. There is a portrait of her hanging in the dining room, and upon walking past it, some claim to smell the scent of lavender. This room was once William’s office, and where he eventually committed suicide. A few male visitors have reported being ‘violently pushed’ out of this room, reputedly by William’s ‘ghost’. But he liked the ladies. Lillian suffered at his constant philandering and scandal-causing drunken debauchery with prostitutes at parties in the underground caves. Reputedly, William continues his lechery still, making voyeuristic appearances in the women’s bathrooms! The troubled marriage ended in divorce, but not before William’s womanizing ways led to the birth of an illegitimate son…according to legend. This child reputedly had Down Syndrome, and was hidden in the attic away from the public eye. He is cruelly referred to as the “Monkey Face Boy”. There is only anecdotal evidence to attest to the existence of this child, based on the ‘testimony’ of a psychic. However, the tale smacks of a moralistic warning and urban legend. The unnamed boy is believed to be a permanent ghostly resident of the Mansion, and has been ‘seen’ from the street, peeking from the windows (perhaps these have been real guests?). Other reports state that the lad plays with toys he finds on the premises. Some claim to have heard him call out, “Come play with me”, seeking the love and attention he never received in life. Is the Lemp Mansion really haunted? It certainly has a well-crafted reputation as a haunted house. I didn’t experience any phenomena first-hand, nor had any of the visitors or staff members that I interviewed. Nevertheless, these haunted stories form part of the folklore of the Mansion, and haven’t been bad for business, either.